Life’s been a bit hard lately and sometimes I find I just want something light and easy to read, but with a story that feels real, not a fluff piece that leaves me unsatisfied – and there’s a whole lot of those out 😉 I’ve found when I’m in this mood Choc Lit novels tend to deliver and this one once more fitted my mood perfectly and took me out of myself for a while. I hadn’t realised there were earlier book/s featuring these characters, and hadn’t read them but Marsh and Jane, that sounds a fun read. Still, we’re with Stevie and Tom now, Stevie being Marsh’s little sister and Tom an ex housemate of his. Marsh brought up Stevie after their parents died when she was 13 and he around 21-22. She lived in the student house for a while and had a crush on Tom, and it didn’t go well, she did something that caused friction between Tom and Marsh, but that’s all in the past she thinks. She picks up one sort of in her field but its not without problems, low pay, difficult person to work with in Lady Beryl, but she’s offset by the lovely Evelyn and her niece Alice, and another lady, the wonderful Priya, the main connection to the charity the ‘ball is supporting. All looks good but there’s a huge boulder in the way and its…Tom, who’s Evelyn’s son. He still thinks of Stevie as a kid so he;s a bit shocked when he meets her and there is some fabulous humour thrown in, such as when he’s recounting the meeting to his friend Og (Olivia). He has to admit all his plans of being tough, of negotiating the best deal ( or preferably not letting her get the job) go out the window when he sees her, is stunned at how she’s grown, is fiercely attracted, and just as she asks him a question he chokes on a biscuit. By the time he’s recovered the deal is done, Stevie gets her way and he’s lost the chance. From then on its a race to make the Ball go well, offset by the usual issues, lack of time money and a celeb to bring in ticket sales. The house, Evelyn’s, is wonderful and I loved the descriptions of it and the gardens, sounds a lovely old home. The characters and situations are so real, we’ve all met ones like them, and organising things when there are several people involved leads to friction all too often. I was involved in an art exhibition with ladies from a local art group a few years back. Got to the venue, no one wanted to go first, but we finally started putting works up ready for display, and then one lady came in late, started complaining about how things had been done, grumbled very vociferously, which set others off and it really was a Handbags at Dawn scenario! Never again…. The humour is threaded throughout along with some very real issues, Stevie’s feeling of abandonment, Tom’s work pressures and stress. Evelyn’s missing her lovely husband since he died, Lady Beryl wanting to be in control but not do any work, thankfully Priya is one of those gems who get things done quietly, Alice, typical teen with teen issues, and Marsh, devoted brother who now needs to see his sister as grown, not as the kid he needed to guide so carefully. Vienna, (or Salzburg or wherever! ) was good, a real B itch but I’d like her claws to have been even sharper, she was perfect for that role. I have to mention this part which made me snigger. the posh Lady Beryl has heard one of the people at the ball has donated a large sum in order to have a ward at the Sri Lankan hospital named after his wife, so she’s persuaded her husband to do the same. Priya says how sweet that is, to immortalise a loved one in that way, named after a ward. Depends on the ward though Tom says – it’s not so good if its the Dysentery Clinic!! I loved it – its a magical story,fun and gentle humour, perfect ending and one I really enjoyed reading. Would it get a second read? Yes, if I’m in the right mood, its a “full” read with lost to see and I’m sure I missed some of the more subtle clues. Stars: five. 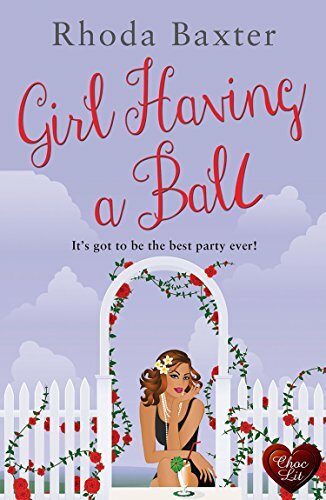 a great fun read with a perfect HEA.